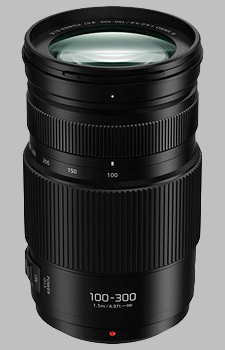 (From Panasonic lens literature) Drawing subjects in from a distance, this 300mm (35mm camera equivalent: 600mm) ultra-telephoto zoom lens is ideal for capturing intense action sports, or even animals you couldn't normally get close to. Unlike conventional lenses, LUMIX G lenses like this one are small, lightweight and fit perfectly in the palm of your hand. Now you can take professional-looking shots of an athlete -- and even capture individual drops of water falling through the air. With video support any user has everything they need for recording with their LUMIX camera. Not only does it perform smooth aperture changes, so there are no sudden jumps in exposure, it also boasts a silent design for enhanced capture of the scene's audio. What's more, the stunning AF performance of this lens records excellent 4K video, where precise focusing is essential. Superb OIS. Good build quality. Usably sharp ar 300mm. Light, compact for 600mm equivalent. None, considering price although 70-300 would have been bit more useful. Brilliant lens used on my g85. Sold my Nikon 70-300 which was softish at 300 on a d7000. This is sharper at full zoom, and is effectively 100mm longer. Amazing to be able to use a 400/600mm equivalent handheld at quite slow shutter speeds. The dual IS is very effective.